After years of supplying unlicensed medication to the NHS, Rokshaw Laboratories has now started to move into the private sector, manufacturing for private clinics across the UK. Delivering the same high service standards as our service to the NHS, we will work directly with you to understand your needs for a particular manufacturing project so you have the peace of mind that your medicines will meet the exact requirements of your patients. We will also ensure that your products are delivered within a very short timescale and provided at a sustainable and ethical price. 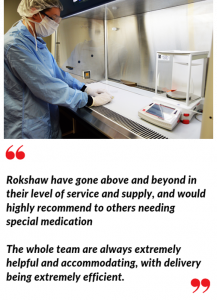 If you are a private clinic or hospital and require unlicensed medication for your patients, then look no further than Rokshaw Laboratories as your trusted supplier!